Recent investigations and researches confirm that the prehistoric dolphin, known as the ichthyosaurus disappeared from the ancient oceans during late Cretaceous Period, because of the drastic climate change and a slow evolution. Ichthyosaurus, known as sea dragons as well, were prehistoric dolphin-shaped reptiles that reign the ancient seas for 157 million years. Previously the extinction of the ancient reptile was explained as a cause for the low species diversity, making them more vulnerable to increased competition with other predators and low main food source. 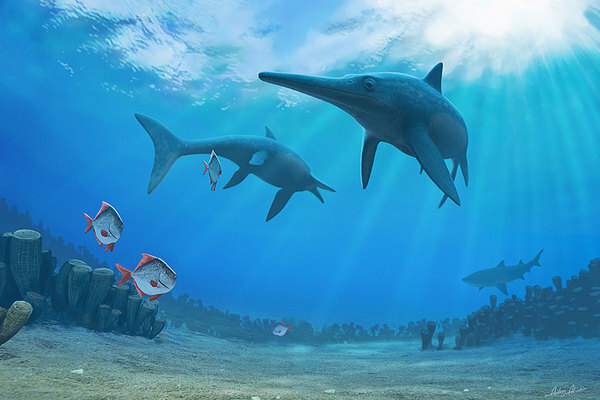 However, a recent research made by scientists from Britain, Belgium, France and Russia published in the journal Nature, shows that the main reason for the ichthyosaurus disappearance was caused by a sudden global environmental change that started a major turnover that profoundly reorganized marine ecosystem during the Cenomanian Period. The study authored by Dr Valentin Fischer, of the University of Liege and University of Oxford, analyzed surveys of literature and museums collection including assessment from the Cenomanian period and updated systematic framework of the Ichthyosaurs. To understand better the environment that the species lived in and how it adapted for the 157 million years of its existence. The investigators first noted that for millions of years the ichthyosaurus, was able to adapt to the aquatic realm and succeeded during Triassic and Jurassic period, and the fossils proved that no other marine reptile, at the time, could compete with the animal. So the theories that allegedly confirmed that lack of adaptation was the main cause of its extinction, became unsettling. During the time of the ichthyosaurus existence, the world’s environment was very different from today’s environment. Global temperatures were rising and sea levels were extremely high. However, the constant change in the environment led to a large drop in the sea levels and the geochemical cycles were disrupted. During this processes, many aquatic creatures were unable to adapt and quickly died off. Although the ichthyosaurus was able to adapt to climate and ecological changes, the slow adaptation and constant climatic volatility forced the creature to its extinction. According to Dr. Valentin’s study, this is the only logical explanation for the ichthyosaurus disappearance in the Cenomanian period. Other marine groups also saw an accelerated evolution in the ocean that led them to extinction as well. Changes in sea levels and ambient alterations affected a large amount of the marine ecosystems, from coral reefs to large predators. There’s still not an exact date for the ichthyosaurus extinction but the team estimates that the reptile met his disappearance 28 million years before the major marine death at the end of the Cretaceous Period.